Swami Satyasangananda Saraswati, popularly known as Swami Satsangi, was born in 1953, in the small town of Chandernagore, West Bengal, India. Although from childhood she had a completely modern education and upbringing, she opted for the traditional life of renunciation and sannyasa after she had a series of inner awakenings at an early age, which led her to her guru, Sri Swami Satyananda Saraswati. She was initiated into the Dashnami tradition of sannyasa on 6 July 1982 at Ganga Darshan, Munger. Thereafter she travelled extensively and ceaselessly with Sri Swami Satyananda Saraswati on his tours in India and abroad, which gave her immense exposure and contributed to her development into a scholar with deep insight into the yogic and tantric traditions as well as modern sciences and philosophies. A truly inspirational teacher and gifted writer, Swami Satsangi is the author of major texts on yoga and tantra, such as Sri Vijnana Bhairava Tantra: The Ascent, Karma Sannyasa, Light on the Guru and Disciple Relationship and her latest, The Descent, a commentary on Adi Guru Shankaracharya’s famous poem of divine ecstasy, Sri Saundarya Lahari. One of her most acclaimed books, Tattwa Shuddhi: The Tantric Science of Inner Purification, outlines an essential practice for inner experience which she herself developed and presented. Her ability to articulate ancient teachings from yogic, tantric and vedic texts and bring these into a modern context makes Swami Satsangi an ideal teacher to transmit the wisdom of her guru’s teachings. In 1989 when her guru Sri Swami Satyananda Saraswati, ordained by an inner mandate he received in meditation, went to live in seclusion at a remote rural village in Jharkhand known as Rikhia, Swami Satyasangananda was the person who located the place he saw in his vision and negotiated the purchase of the land, which was to become the tapobhoomi of Sri Swami Satyananda Saraswati. At that time Rikhia was a poor, nondescript, unknown village in one of India’s poorest states. No roads, no electricity, no phones, no shops, no traffic, no trace of the 21st century, that was the Rikhia she entered in 1989, to prepare for the arrival of her guru. 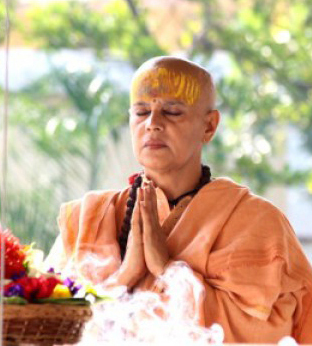 Since that time Swami Satsangi has dedicated herself to fulfilling her guru’s vision of uplifting the neglected, impoverished and downtrodden villagers in the surrounding areas of the ashram, by implementing the cardinal teachings of Paramguru Sri Swami Sivananda Saraswati: Serve, Love, Give. Her tireless and unceasing efforts, which are carried out under the banner of Sivananda Math, an institution founded by Sri Swami Satyananda Saraswati in 1987 at Munger in memory of his guru, have transformed the entire area into a vibrant centre of spirituality where people throng in large numbers for spiritual solace. On January 1st 2007, she was appointed as the Peethadhishwari of Rikhiapeeth by Sri Swami Satyananda Saraswati. Presently she resides at Rikhia, and is dedicated to implementing Sri Swami Sivananda Saraswati's three precepts of serve, love and give, working tirelessly for the material and spiritual upliftment of the local community, who are the neighbours of her guru. She travels nationally and internationally carrying the light of Sri Swami Sivananda Saraswati's and Sri Swami Satyananda Saraswati's teachings to all.